Delta, which is the 4th letter of the Greek alphabet, is widely used in mathematics and science. Unfortunately, most keyboards don’t have this key and you would have to use different methods to get it in your Excel spreadsheets. 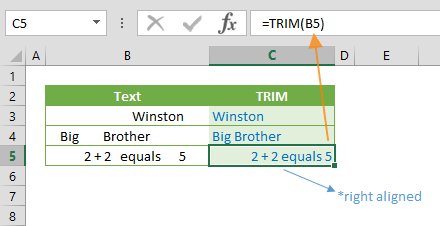 In this article, we’re going to show you 5 ways you can use to insert a delta symbol in Excel. 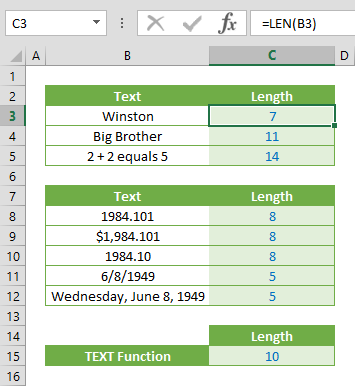 Excel (like other Office tools) has a Symbols menu where you can find all supported characters. You can find the Symbol dialog by going to INSERT > Symbols > Symbol path in the Ribbon. 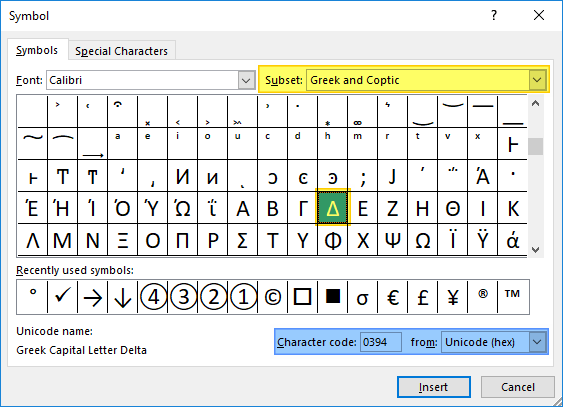 In the Symbol dialog, select Greek and Coptic from the Subset dropdown and scroll down to find the delta symbol character. Select the delta symbol and click the Insert button. Alternatively, you can use the code associated with the character. 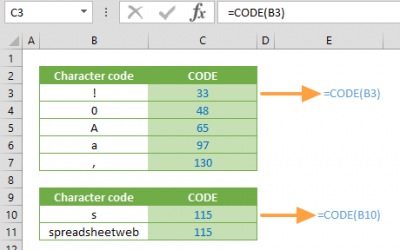 First, select Unicode (hex) from the from dropdown, and then type in 394 into the Character code box. The delta symbol can be found in the font named Symbol. 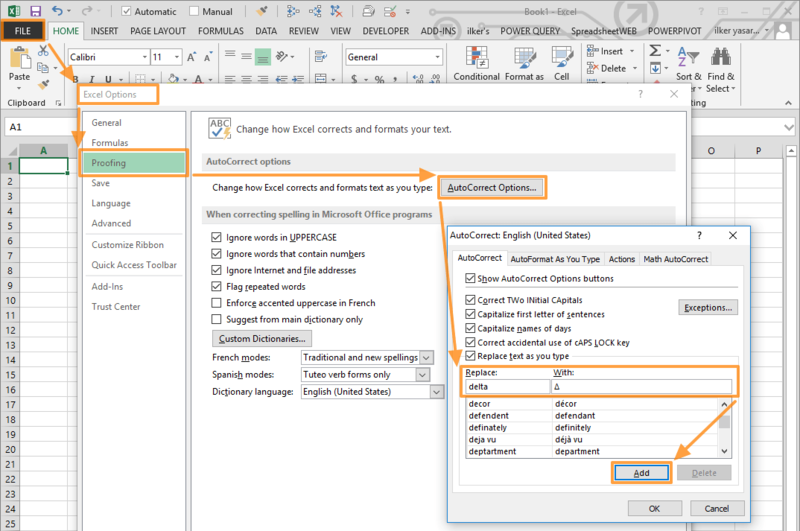 All you need to do change the cell font to Symbol and type in “D”. The “D” character must be uppercase. 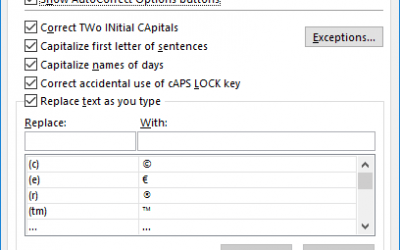 AutoCorrect is an essential Excel feature that automatically corrects common typos. 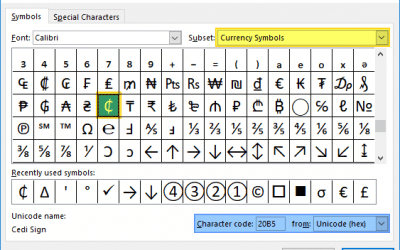 An alternative use of this feature is ability for inserting symbols by typing their codes. For example, typing “(c)” will create the symbol ©. You can add a new rule for the delta symbol to customize this feature for your needs. Open the Options window from File tab in the Ribbon. 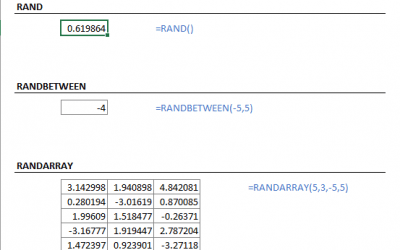 Click Add and then OK button to apply the rule and return back to your worksheet. We chose the string “delta” for this symbol. Once the changes are saved, typing in “delta” will insert a delta symbol. As a workaround, you can add a solid triangle to mimic the delta symbol. All you need to do is to hold down the Alt button, and then type its code. While holding the Alt key, press 30 to add a triangle.